The transition to the zero-carbon economy is the inclusive growth story of the 21st century. The world economy must grow over the next 15 to 20 years to overcome poverty. To avoid dangerous climate change (ie implement the Paris Agreement) emissions must peak as soon as possible and be cut by at least 30% in the next 15 years. Otherwise we risk halting and reversing economic development, and forcing hundreds of millions of people to move, with real risks of severe and extended conflict. Thus it is clear that we need a new type of growth if we are to radically reduce carbon and move to net-zero emissions as close to 2050 as possible. And we are in a hurry to establish this new type of growth because infrastructure will double in the next 15 years and the world economy will double in the next 20 years. We must not lock in old and dirty technologies. The good news, as we lay out in the new report by the New Climate Economy, is that the transition to the zero-emissions economy is the growth story of this century. This is a still stronger statement than the case made by the Stern Review in 2006 that the costs of inaction exceed the costs of action. We can now see a bigger story, one of innovation, discovery, investment and growth. And it is a much more attractive form of growth, with cities where we can move and breathe, and ecosystems that are robust and fruitful. The new report sets out what we must do in five key sectors: (i) clean energy systems (ii) smarter urban development (iii) sustainable land use (iv) wise water management, and (v) the circular and resource-efficient economy. 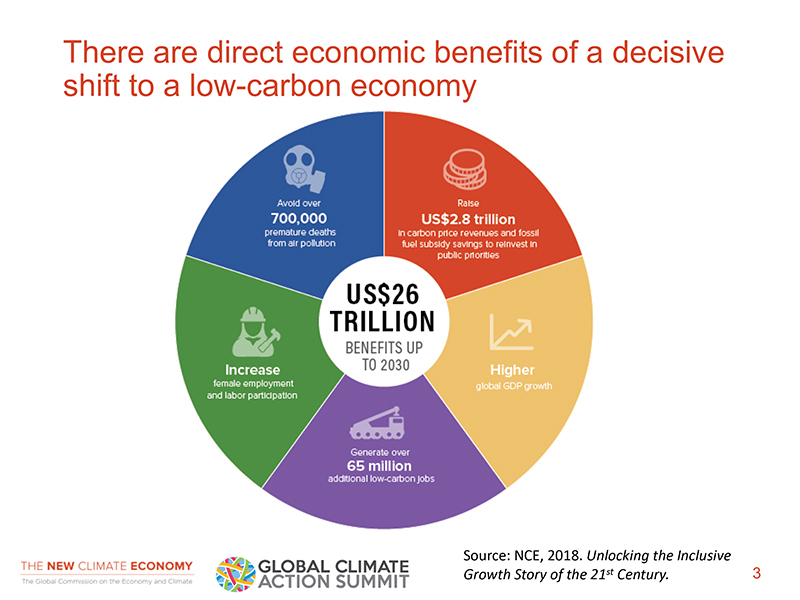 And it sets out the policies that can deliver both growth and the necessary emissions reductions: (i) price carbon and mandate carbon disclosure (ii) accelerate investment in sustainable infrastructure (iii) foster private sector innovation, and (iv) ensure a just transition, with people at the centre. The benefits are many as the graphic behind me shows, including not only stronger growth but also 65 million jobs by 2030. But delay is very dangerous. This new growth story is in our hands. Now is the time to decide and act. It is a time for leadership. But to get global results, we know that action has to happen from the ground up. That is the story of this Summit.